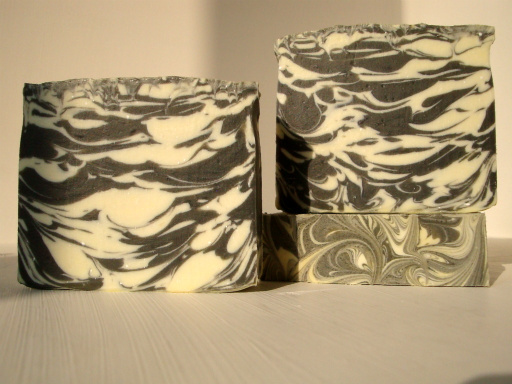 Following on from the recent poll I held on Facebook, the Vanilla Anise fragrance I had delivered about two weeks ago was the second favourite for me to soap. 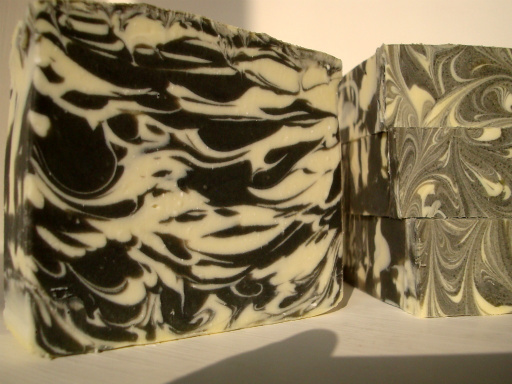 I simple adore this scent - it's light and dark at the same time, very grown up, very unisex. I haven't met anyone yet who didn't like it. 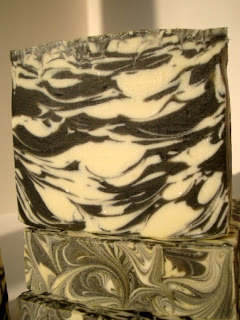 It's described as a blend of vanilla orchid against a spicy accent of anise and the warmth of vetiver, amber and clove. 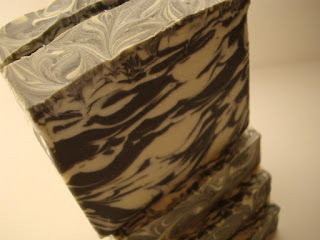 For people who don't like vanilla, you'll still love this - and I know that Dennise of Briny Bar Soap has given it a total thumbs up .. she even took it on a road trip across the States with her and uses it as a shampoo bar! It's had a revamp since I made it last (it was one of my tester fragrances, I wanted to see how it'd behave and how well the fragrance would last - I was very happy with both tests!). I wanted something more dramatic though - I thought the original look just didn't do the fragrance justice. For this version, I've used Golden Olive Oil, Cocoa Butter, organic Palm Oil (of course, from a sustainable source), Coconut Oil and Castor Oil (gotta love them bubbles!). 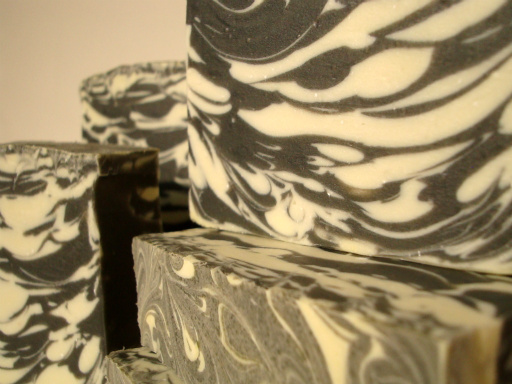 As ever, I added Pure Silk - this really adds a luxurious element to the soap, I just wouldn't be without it (we deserve it people!). It's coloured with titanium dioxide and black mica that I bought from the US. 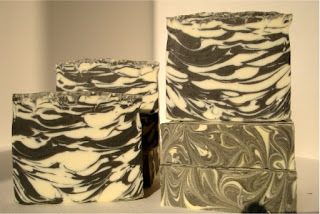 I'm dying to hear what you think of this - I was inspired by a fellow soaper, Ka fée from Soap Session who made a similar soap and I just had to try it out. I hope she is impressed with it! Oh and I'm calling it Adam & Eve, because my hubs had to help me with the design; once I'd preppred everything and got the mix into one jug of raw black soap and one of raw white soap, I needed to get it into the mould as soon as I could so hubs helped about half way through and worked with the white as I worked with the black. Adam & Eve is named for us but it helps that it's a very unisex fragrance too! Soap Tops - Look Ma, NO glitter!! I really hope you enjoyed these pictures - if you're interested in buying Adam & Eve, it will be fully cured on 30 May and will be available in our online store. That is amazing!!! And now I have to try it, of course! Yours looks just like hers - and even though I don't speak French (despite the 2 years I studied it in high school), I can figure this out. LOL! This is really stunning. 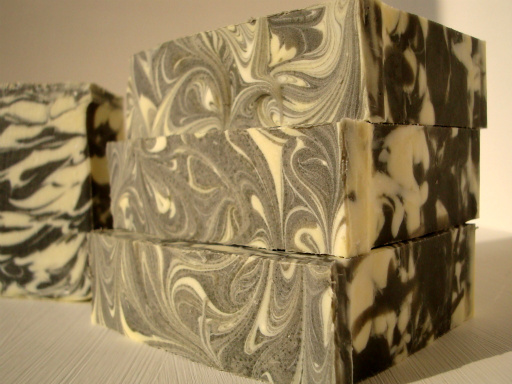 I tried this same style and mine came out a bit differently because my soap got a tad thick (I used Blackberry Sage) but your Vanilla Anise sounds divine. I loved the molds on SoapSession site as well, she has a plexiglass one. Looks like your hubby was a great help. it's really stunning looking. how long do you think it took you to spoon all those layers? Amy - give it a go and please make sure to show us pics! I found it very easy, as long as the soap is at the riht level of trace. Splurge - I was hoping the VA wouldn't acclerate trace and stop me from doing this properly - the Blackberry Sage one seems to have for you. I have heard that it's hard to demould from the plexiglass mould, I think it can affect the stickyness of your soap. P-Lee - Hmmmmm think it took about 20 minutes or so, I can't quite remember because I was taking it easy first and then realised I needed to move quicker!!! Beautiful soaps ... the colors are fantastic..
Who says soap isn't good company?